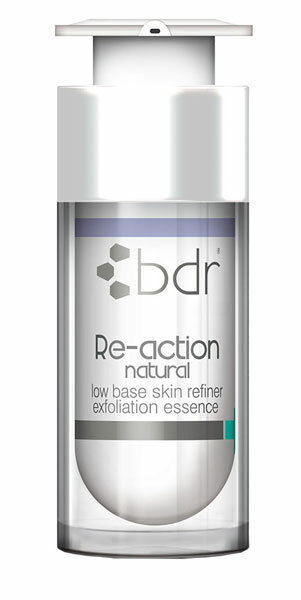 bdr medical beauty Exfoliation with Re-action E, natural or deep. PROTEC CM GLUCAN: CM-Glucan is a Polysaccharide, gained from yeast. It´s able to push the wound healing, skin irritations are reduced, and skin owned protection functions are lifted, as well. ZYMO CLEAR MD: The extremely innovative active ingredient is of biotechnological origin. It quickly dissolves and dead skin cells – a gentle keratolysis and smoothing of the skin. In addition, it is known for a reduction of sebum content. BAMBUSA ARUNDINACEA STEM EXTRACT: Light but intense peeling powder made from a special bamboo from the mountain forests of India, contains at least 87% silica. The microfine ingredients rounded off by a special procedure make the peeling suitable even for sensitive skin. ARGANIA SPINOSA SHELL POWDER: Made of argan peels finely ground in excellent organic quality. CAFFEINE: Tightens and smoothes the skin, stimulates the metabolism, has a purifying and draining effect. The invigorating intensive tonic has a balancing and moisturizing effect. Due to its compatible formula, it is appropriate for all skin types. 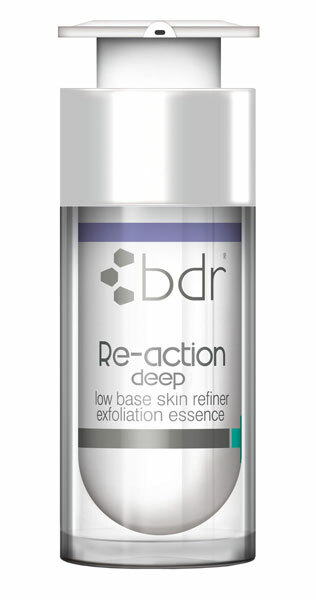 Exceptional active mechanisms prepare the skin perfectly for subsequently applied bdr serums and skin care products. Dairy and salicylic acid ingredients have a mildly abrasive and exfoliating effect, immediately causing a supple and smoothed appearance with refined pores. Once or twice daily after cleansing. Apply sparingly and gently with cotton pad. Avoid contact with mucous membranes! LINDE FLOWER EXTRACT: Achieves smooth surface skin by the reduction of roughness and irregularities. Shields against the harmful effects of external influences and lends the skin a pleasant freshness. It’s astringent, soothing effect is particularly beneficial for sensitive skin. HOPS: Is extracted from the flowers and young hop shoots and has a soothing and balancing effect. GINSENG: Leaves skin supple and is helpful against harmful effects due to external influences. Promotes blood circulation and revitalizes. HAMAMELIS: Hamamelis, also known as witch hazel, is an extracted from leaves of the hamamelis virginiana bush containing hamameli-tannins and essential oils. Tannins have an astringent and toning effect. CAMPHOR: Acts antiviral, antiseptic, stimulating, bactericidal, blood circulation enhancing and anti-inflammatory. LYSINE: Accelerates active ingredients and stabilizes PH levels with a moisture retaining effect. Apply our ultra-compatible, highly active glycolic or fruit acid 2-3 times a week, after your evening cleansing ritual. The fine molecular acid obtained from lemon, milk and sugar cane refines skin and pores visibly and significantly. Uneven skin is smooth, even and much clearer. The complexion is radiant and fresh. This unique composition removes dead skin cells very gently and effectively. The epidermis is clarified,the purification of the skin is facilitated. Regular application dramatically reduces the effects of photosensitive skin aging. 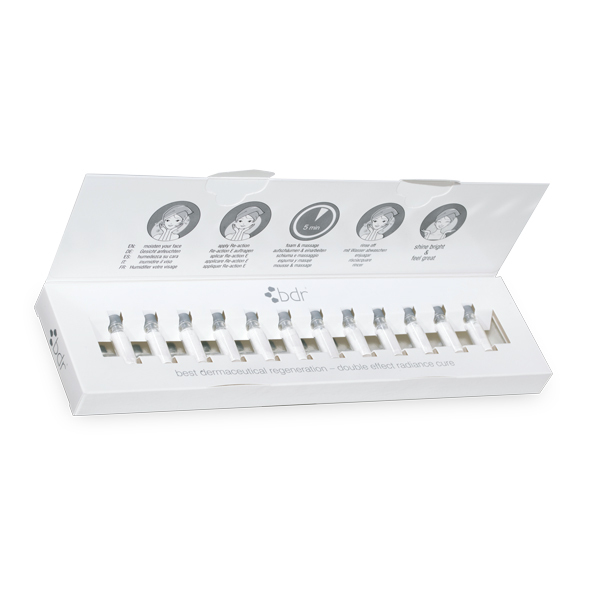 Regular use dramatically reduces the effects of photosensitive ageing. LACTIC ACID: Is found in the hydro-lipid film of the skin, where it helps stabilize of the protective acid mantle, binds moisture and controls the keratinization of the epidermis. Since lactic acid is pH-regulating, it can inhibit the growth of foreign microorganisms on the skin. Lactic acid is generally an excellent skin moisturizer and moisture binder. Higher concentration of lactic acid are used as gentle skin surface peels and in cleaning and care products for blemished and acne-prone skin by reducing the keratinized cells and extracting comedones. CITRIC ACID: Citric acid occurs naturally in citrus fruits and belongs to the group fruit acids. Citric acid acts especially astringent and toning, supporting the healing process. The antiseptic effect is particularly effective against blemished skin. Due to the relative weak acidic properties, citric acid is also effective against fungal infestation. GLYCOLIC ACID: Glycolic acid is an ingredient found naturally in sugar cane juice from the sugar cane plant and belongs to the group of alpha-hydroxy acids. Glycolic acid provides multiple benefits in cosmetic products: It dissolves keratinized skin cells by softening the adhesive cell structures in the horny layer. Skin regeneration is stimulated and lines and wrinkles can be reduced. The skin texture is refined, with a clearer complexion, increased moisture retention and elasticity.